Home » Vermouth	» Vermouth? Really? Like most people with moderately well-stocked home bars, I have a couple dusty bottles of aging vermouth. A whisper of the dry vermouth occasionally provides a veneer of propriety to what would otherwise just be a big glass of vodka, and the sweet, red version appears in slightly greater quantities in my Manhattans. That’s about as far as I’ve gone with my vermouth experimentations. Europeans sometimes order a glass of vermouth, as I learned years ago in Paris when a friend ordered a martini. The waiter returned with an aperitif of Martini & Rossi Bianco, a dry vermouth, on the rocks. She felt less than pleased with her “martini,” but according to the Wall Street Journal, she is one of the few Americans to have drunk vermouth properly. 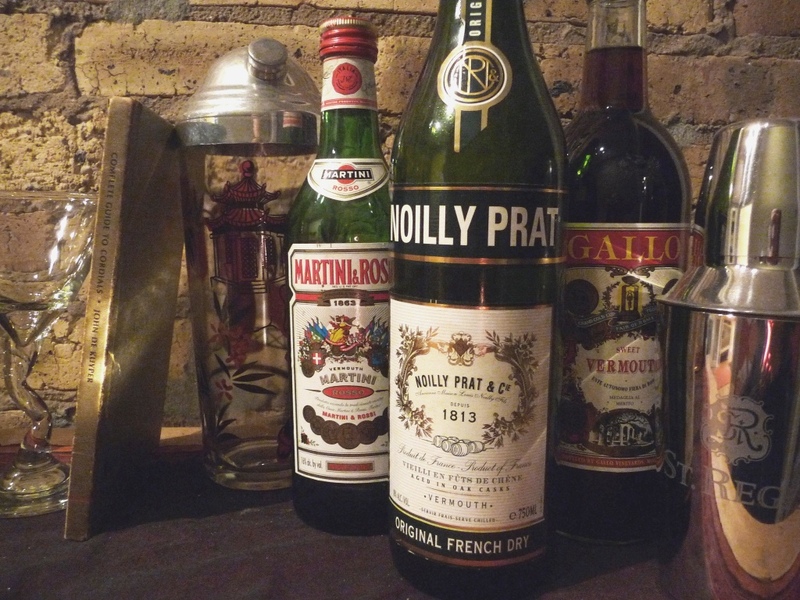 The recent article Straight Vermouth, No Chaser claims vermouth can be a lovely drink all on its own. And who are we to doubt the Wall Street Journal? One– as mentioned elsewhere I have had Vermouth ‘properly,’ in Spain as an aperitif– cold in a glass with a slice of orange it was a wonderful balance of sweet and slightly bitter herbal. Great on a hot day. That Spanish aperitif sounds lovely! Especially on a dreary Chicago day like today. And thank you for your very kind words! Interesting post, Rob . . . I’ve never actually tried vermouth by itself. Like you, I usually add a dash to my vodka. This weekend, however, I shall experiment! Fantastic – you’ll have to let us know how it goes. Happy drinking! First time on the blog and I love it. I also was in Paris and had my French-speaking friend order me a gin martini. What came back was exactly what you described. I was infuriated that I didn’t get my much anticipated gin but I drank the vermouth regardless. It wasn’t unpleasant, just unexpected. It is quite lovely actually. I have had vermouth on the rocks, and with a slice of mandarin. It is dry and elegant tasting. Not too much.. just right. Absolutely – vermouth can be a delight, especially nowadays, with so many delicious brands on the market. I like adding the slice of mandarin – that sounds like an ideal garnish. I’ve been drinking dry vermouth on the rocks for nearly 40 years and I’ve never tired of it. I much prefer the dry vermouth to the red, which I find a bit too sweet. Martini & Rossi is the best lower cost vermouth on the market, and Gallo makes a pretty good one also. I first tried vermouth on the rocks after seeing the smart and sassy Martini & Rossi commercials in the 1970’s. I’m in my 60’s now and don’t drink much hard liquor anymore, but I love vermouth on the rocks. I think I’ll go pour myself one right now. Cheers! Ha ha! Cheers to you as well! I agree about Martini & Rossi — their dry vermouth is a standby for me. There is no denying that a glass of a good vermouth on the rocks can be a delight, and it’s a little easier on the system than hard liquor, certainly. As vermouth drinking has become a little more widespread, it still startles me that many waitresses and bartenders (in the USA anyway) still look at you as though you had two heads if you order dry vermouth on the rocks. They almost always do a double take and ask “you want what?”. Then I calmly (but with a little exasperation) tell them to fill a martini glass with a few ice cubes and fill the glass to the brim with dry Vermouth. Then the hilarity ensues when they finally bring you your favorite drink and laugh off their ineptitude all the while struggling to figure out how much to charge you for it. They make you feel like you ordered something that’s been out of circulation since the middle ages. Bizarre! Vermouth is my go to! I love it and enjoy it so much. You do not have to go as far as Europe, it is a very common aperitif in Mexico (because of the Spanish influence of course). Sweet Vermouth on the rocks with an orange wedge or peel is my go-to first drink whenever available. I’ll admit those bottles at home disappear faster than they should. It’s strange looks or the “With what Vodka?” question which makes me cringe because if we are doing a martini with vermouth well, it has to be Gin, in my opinion. If y’all have not tried Sweet Vermouth on its own, you should. Martini & Rossi and Cinzano are good common brands that many restaurants carry. My personal favorites are Gallo (which I see in the picture above 😀 ) and definitely Cocchi Vermouth di Torino!